Monsanto, the multinational agricultural giant who sells 90% of the world’s genetically engineered seeds, has been in the news a lot this month… and as usual, it’s not the kind of press they’d like to have. We usually post a funny image, video, or story on Fridays. 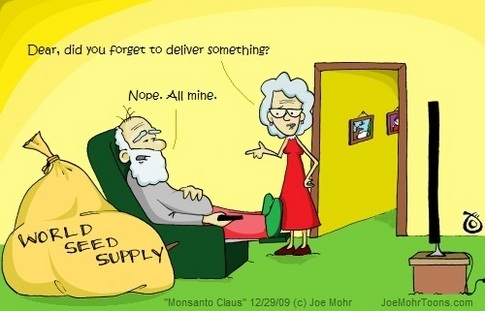 For that reason, we’re going to chuckle over some incredible Monsanto illustrations by the talented cartoonist, Joe Mohr. …but we’re still going to file this one in the [not-so] funny Friday folder. Read on below the cartoons to learn more about what they’re alluding to. This cartoon originally appeared on Wend Magazine’s Wendblog. It’s making a pretty blatant point about the multiple ways Monsanto is holding the world’s seed supply hostage. This cartoon appeared on Ecopolitology a couple of days ago. 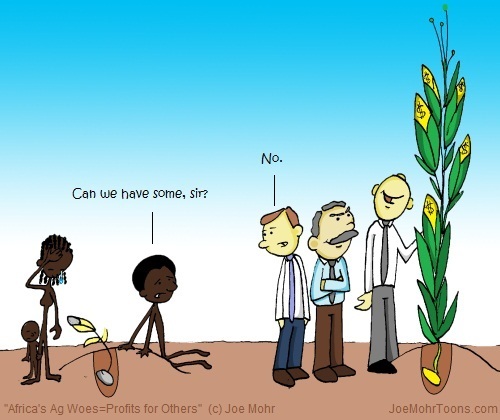 Millions of Africans (and people in countless other 3rd world countries) are suffering and dying from failed agricutural ventures. Monsanto has the seeds that could help feed the masses but instead chooses to “let them eat cake”, as it were. 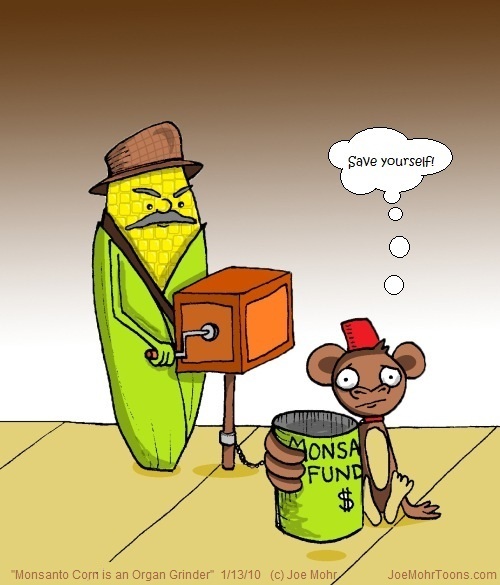 This cartoon was seen on Twilight Earth — who, along with Organic Lifestyle magazine, is one of THE authorities on all things Monsanto.Twilight Earth recently reported on a December 2009 study that was published in the International Journal of Biological Sciences which shows that 3 varieties of Monsanto’s genetically modified corn cause organ damage in mammals. This, of course, means that maybe those African’s with agricultural troubles should be glad that Monsanto won’t help out with free or low-priced seeds. Sign Change.org’s petition to force Monsanto to stop producing GMO (genetically modified organism) corn. Check out the movie, “Food, Inc.” for more information about GMO’s and Monsanto. Instead of being AGAINST Monsanto, why not be FOR self-sufficiency. You can start your own garden…even if you live in an urban environment. Check out my friend, Mike Lieberman, the Urban Organic Gardner for more info. Shop organic at your local Farmer’s Market. What other ways can you think of to help cut the Monsanto noose that holds the world’s agriculture in a strangle hold?